Hibernian's Ivan Sproule says harsh treatment from referees could force him out of Scottish football. The Ulsterman was sent off by Stuart Dougal in Saturday's 1-0 defeat at Celtic, and feels he has been singled out for criticism by boss John Collins. "I'm really annoyed and down and I just can't understand it," Sproule, 25, told the Daily Record. "Dougal has sent me off before, and the boss said things about me 'tightening the nut', which I felt was unjust." 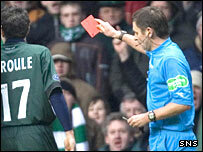 The Northern Ireland international's foul on Lee Naylor earned him an immediate dismissal at Celtic Park. And his challenge led to Collins' criticism, even though he also felt the decision was harsh. But Sproule insists he is becoming a marked man in the SPL. "I just can't understand it but it's the kind of thing that will maybe force me out of Scotland," he added. "I would hate to leave Easter Road because Hibs have been fantastic to me. "All my team-mates have backed me - they have been brilliant as we are a close-knit team." Sproule joined the Edinburgh club from Northern Irish side Institute in January 2005, and has hit 16 goals in 79 appearances, including nine strikes this season.